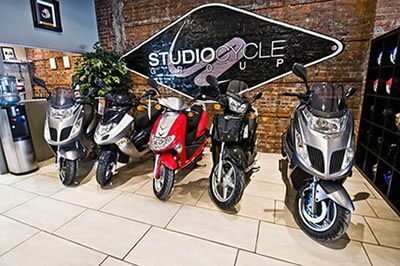 Studio Cycle Group, Toronto’s only scooter, motorcycle, and ATV dealership, is now hiring a full time salesperson. This is an exciting opportunity for anyone looking to enter the industry. The tag line: Loving your job – isn’t it time you tried it? In the past we’ve been extremely happy with our purchases from Studio Cycle Group. It’s getting harder and harder to find motorcycle gear in Toronto and motorcycle dealers in Toronto. Ashley and I have bought Arai and Fulmer helmets, NEXO and ICON gloves, Alpinestars boots, and NEXO jackets and of course my brand new KYMCO Venox in 2009. They also carry a variety of used motorcycles. Read our Studio Cycle Group review or visit their site for more Toronto motorcycle goodies.